You know, sometimes the balls just won’t roll your way and this was one of those tournaments. I was not seeded for this tournament and I got really punished for that. I met Ana Gradisnik (SLO) in the first round at 0900 and never got my game going. 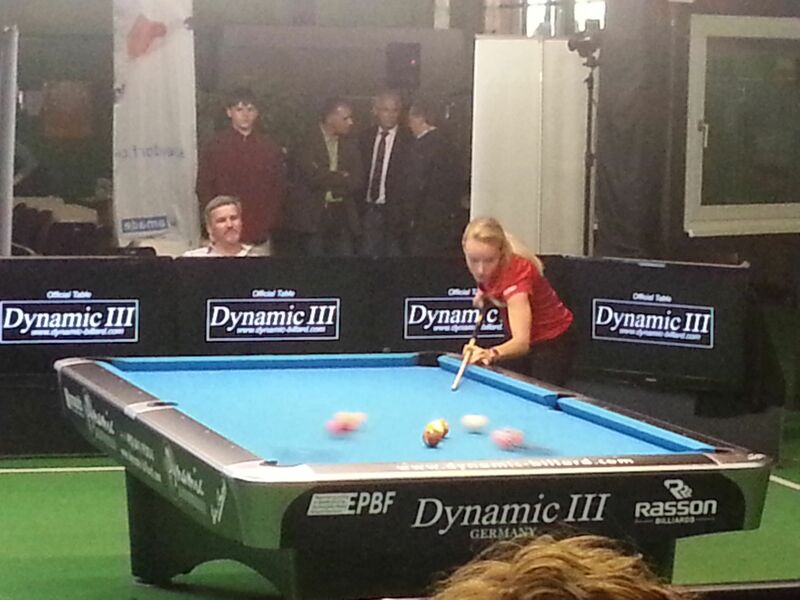 Next match I played 63 year old Sonja Mayer (AUT) and this time I hardly made any mistake and won 7-0. My last match was against Sara Rocha (POR) and after a good game from both of us, she won 7-6 after I made a huge mistake, trying to play a safety. I played really well, got my break working and was on my way to run out on hill-hill. After getting through all the difficulties on the table, I lost the cue-ball and it went 10 cm to far. In my attempt to play a safety I hit the nineball and left the table wide open. That was it, 25th…. When you get a match in the first round you also get one in the first losers round for some reason. Most people had a bye in this round. Ana Mazhirina (RUS) won against Jasmin Ouschan ((AUT), and also climbed to the no 1 spot on the ranking. Congrats! We also made a small video ( kozoom made it, we just did what we were told:)) You can find that on facebook: https://www.facebook.com/photo.php?v=505736936148380. Here is a picture from the final, Jasmin breaking.